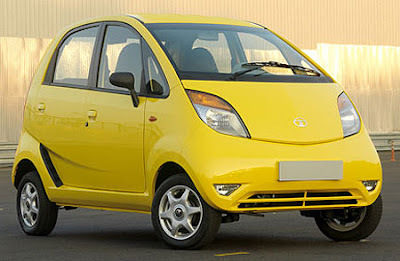 May A Tata Or A Chery Be In Your Future? 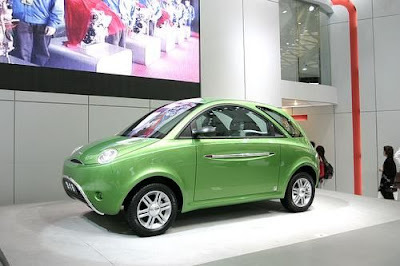 The Tata, made in India, or the Chery, made in China, may actually become names that American's get to know if 15% of car purchasers can have their way. That's right, in a newly released study, fifteen percent of new car buyers in the United States say they would consider purchasing their next vehicle from China, and eleven percent or so would consider buying a car from India. The people surveyed were all were so confident, that they even would purchase a car made from these countries without knowing specific brands or vehicles before hand. If you think this is far fetched, the same study measured found that even though Korean manufacturers like Kia and Hyundai have been selling cars into the US market for about a couple of decades, the American consumer would buy a car model sight unseen at about a sixteen percent response. Based on a national survey of more than 30,000 new car and truck buyers, AutoPacific’s 2009 Research Suite database reveals insights into the willingness of Americans to consider cars and trucks coming from China and India. The just-released study – “Opportunity for Chinese and Indian Brands in the USA” –provides new insight into who these consumers are and what they’re looking for in their next car or truck. “Not only are a significant number of people willing to consider Chinese and Indian brands, this group consists of highly desirable buyers who would be coveted by any manufacturer. 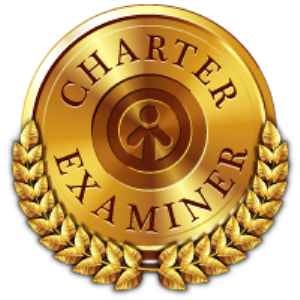 They tend to be young, well-educated, and affluent for their age and have good jobs in administrative, health care and middle management positions,” added Peterson. The study shows Chinese and Indian considerers are more likely to currently own a Japanese or a Korean brand car, indicating that these brands may have the most competition from the new entries, rather than domestic brands like Chrysler, Ford and GM. The study also revealed that while those who would consider a car from China and India rate reliability and durability high, they are not as interested in the dynamics of a vehicle like handling, braking and acceleration. After numerous technical problems, the British Steam Car team successfully carried out its first test run on US soil, yesterday. 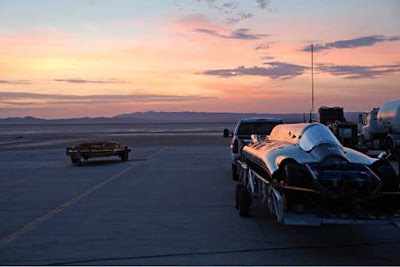 The team has been working tirelessly to get the car ready for the record attempts to break the century-old world land speed record for steam-powered vehicles. The team was in position by 7.00am ready for their first run. 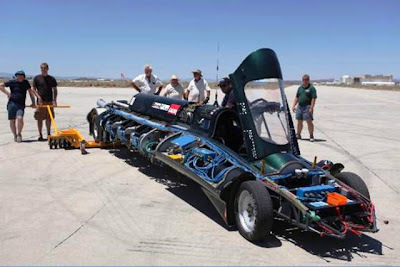 Test Driver Don Wales was strapped into the 25ft-long car that he has nicknamed “the lean, green, mean machine” – because of the technical issues the team has had to overcome. The goal was to replicate the test program that took place in April at Thorney Island. The throttle lag was approx 5-7 seconds but it seemed longer as the vehicle accelerated slowly away. Project Manager Matt Candy said: "We reached 77mph over a very short distance of just 1km which was comparable to our tests at Thorney. We were due to do a high speed return run but the gas rig had trouble refueling and so we had to abort it. We will replace this gas pump tomorrow and resume the testing programme. 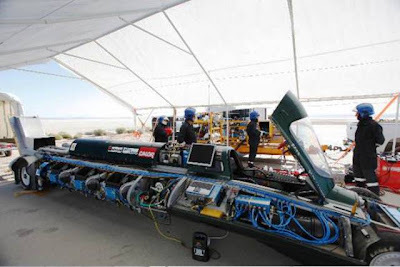 The software has since confirmed that the vehicle produced more steam on the test run than in the UK, a bypass valve was open for approximately 1/5 of the test and the majority of the steam was wasted. This can be rectified, and knowing that it not performing to its full capacity is really encouraging news, as we can utilize the steam to generate more power than we thought we had." Despite the successful test run, the team has taken the decision to delay the record attempt to the week commencing 17th August. Candy continued, "It’s important that the technical issues with the support rigs are resolved before an attempt is made, and these things can’t be rushed. In addition, the FIA officials have to leave on the 4th August to attend Bonneville Speedweek. 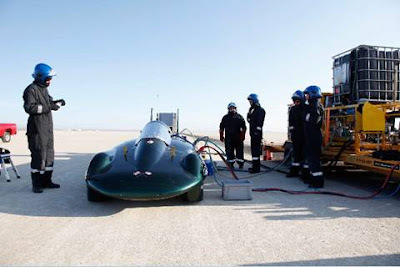 However the FIA are free from the 17th August after they have carried out their duties at Bonneville and can join the team at Edwards to calibrate and record the attempts"
The British Steam Car Team hopes to achieve the official FIA Land Speed Record for a steam-powered vehicle. 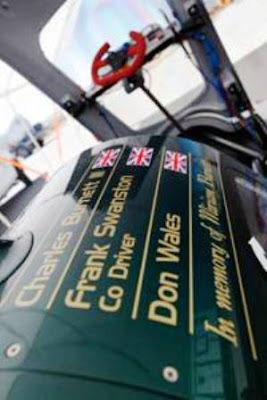 The current official FIA record is 127mph previously set by American, Fred Marriott, driving a Stanley steam car in 1906. When one thinks of aiming for and conquering a world record ... any world record, many people do not realize how much planning and effort is required to even attempt such a feat! Take, for example, the assault of a world record for the land speed of a vehicle powered only with the gaseous state of water that had been heated to very high temperatures - STEAM! Through the use of a turbine, one is able to convert the pressure of steam to a usable power for propulsion. The officially unrecognized mark was set when a failed attempt to create a mass transportation bus powered through the conversion of steam pressure ended when a program sponsored by the state of California was ceased. The turbines that had been developed for this 1969 project manufactured by Barber-Nichols Engineering, found their way into a 1985 attempt to set a world speed record mark. 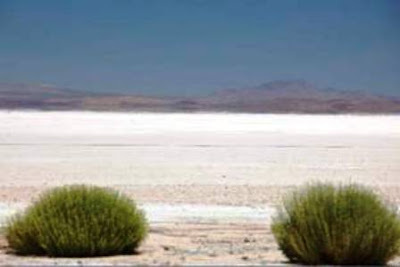 This attempt run at the famed Bonneville Salt Flats in Utah state, was able to achieve a measured speed of 145.607, but this speed was never achieved under the auspicious of a sanctioning body like the Fédération Internationale de l'Automobile (FIA). 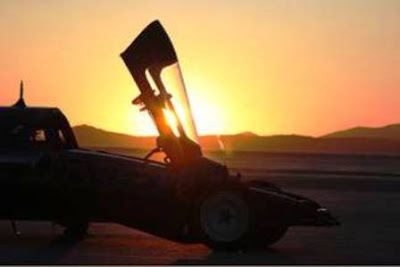 The British Steam Car Challenge believes that to be successful, it must exceed the fastest measured speed and have it recognized by the FIA and at least one other recognized sanctioning body - that mark is faster than 145.607. 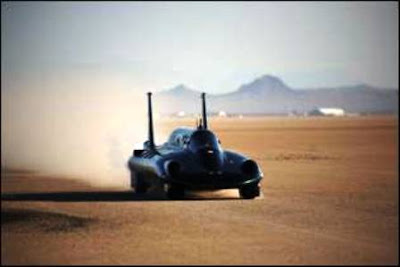 To become a measurable and recognized speed, a land speed record is the average speed of two passes made across a measured distance in opposing directions within 60 minutes of each other. The time of the two runs is then averaged to obtain the official recorded speed. 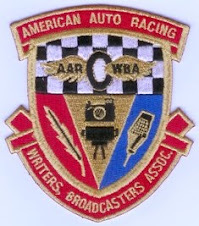 This requirement was instituted in 1910 after the Stanley Steamer Racer record was established but is still recognized as the official land speed record. 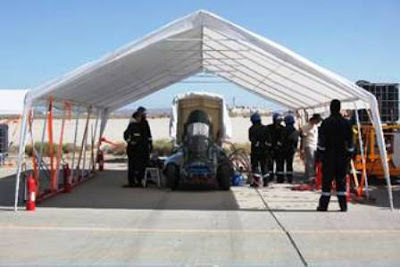 The BSCC effort, if successful, will conform to all aspects of the world land speed record in a way that no other record, sanctioned or otherwise, has been achieved. What a first couple of days! We arrived mid afternoon on Saturday into over 100f dry heat! We got up earlier on Sunday to drive to another nearby dry lake called El Mirage and watched a SCTA sanctioned race event, which is a smaller event than Bonneville but the entrants will be going to Bonneville in August. It was great to soak up the atmosphere and to get us in the mood for our coming event. 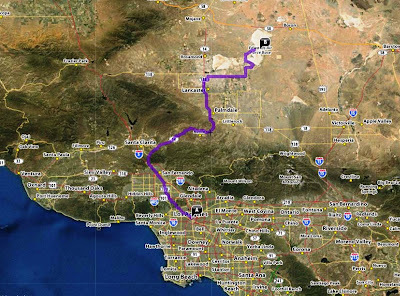 Today we were up at 4.30 and in the cars for 5.00am for the trip to Edwards AFB. Its 30 miles away to the base, we arrived before sunrise but it took a long time to get access due to the strict security. We then drove the remaining 6 miles to where our main pit station is and made ready the tents and equipment. An excellent English breakfast was cooked by Rob! This was the first time that I had seen the car since our April tests. It now has the sponsor’s logos on it and drivers names! It turned out that a sensor in one of the gas tanks had failed during shipment, so the technicians had to strip it out and replace it! This took most of the day. The temperature was really cooking by midday well over 100f and its forecast to get hotter over the next few days. Our camp is positioned in the Southern corner of the base just away from the main runway. We get to see and hear all sorts of aircrafts taking off and landing during the day. Maybe we might get a closer look later! We have a nice concrete perimeter track to work on which then leads onto the lake bed course. However, we have to be escorted onto the lake so I have yet to drive on it! Our plan is to carry out more checks tomorrow and hopefully to get some steam going. Early to bed again tonight! Another early start we arrived to our base just as the sun rose over the mountains, it was beautiful. The air and visibility was really clear and we sensed that it was going to be hot. After another superb breakfast cooked by Rob, I don't how he manages it! The mechanics had another tough day. The car required a new load sensor and Chris Lack had to use the base facilities to adapt a faulty water filter, so we didn’t generate steam. However, these are just little gremlins that the car has encountered during transit and although rectifying the faults is time consuming it’s nothing fundamental and the team is optimistic of steam over Edwards tomorrow. Third day on the lake bed and so far the hottest! It’s been hot but today was bloody hot! We got to our base camp just before sunrise and I was able to take a few snaps of the car being positioned. After breakfast we took another trip over the 6 mile course and continued clearing the stones and foreign objects from the' gravel pit'. We got called back early because the car was going to be steamed up! We all got dressed into our nice black protective gear to run through a complete fill of the car and then into steam as a static test. However, the car had other ideas! We expected problems and I am sure that there will still be more before we actually run the car. On this occasion a new problem reared its ugly head! Whilst filling the gas tanks from the refueling rigs it turned out that the pressure inside the car's tanks was higher than that on the rigs, so the pump could not push the gas onto the car. This was due to the higher temperatures inside the tanks! Hopefully this will be fixed for tomorrow and we will try again. So it was back to the lake bed for the Fodding team and more sweeping! Our camp is on the southern side of Edward and its about 8 miles back to the main gate along some very straight roads with various speed limits on them. Needless to say that I was pulled over for speeding, doing 67 in a 55 limit! I guess the lake bed limit might have to be extended for the record attempt! Luckily I was let off with a caution! Today we were well and truly fried and baked 111f! Too hot, but mad dogs and English men in the midday sun.... We carried on working well into the afternoon! The car was ready for its first steam test after yesterday’s repairs. We wanted a test before it got too hot; we had a short burst of the' Dam Busters' theme tune to get us in the mood! But after breakfast it refused to fire up. We found a blocked miser but fixed it, and then a refueling rig expired, so we had to change over rigs. Each time we restarted the refueling process we managed to get a little bit further into the process. However it was now getting too hot for the car. So in future we will have much earlier starts! Once it was decided the car was not going to be fired up I organized a FOD crew. We have formed a very select team and it’s hard to join without knowing the special 'hand shake' and all the right terminology that Richard and I have made up whilst suffering heat stroke out in the middle of the lake bed!!!! However, we welcomed two new members to our select band today namely Lynne and Mike!! We have a lot more to do; generally the track is in good shape with the odd patch that needs attention to! We drove the whole 6 miles and on the way back managed to get the Dodge people carrier up to 100mph without any police cars chasing us today! By now it was really very very hot and I got a burn on the palm of my hand from the bodywork whilst climbing out of the car! Tomorrow is another day, but the forecast is for more hot weather peaking on Sunday, oh joy! At last, the car is steaming and we are all baking 114 f today with hotter forecast again for tomorrow - oh joy! It has been our most successful to date. We successfully carried out two static steam runs which provided Jerry with a lot of information to sort out for tomorrow! The early indications are that the car is producing more steam due to the altitude at Edward’s and the high temperatures, it means that there is a bit more power and hopefully a bit more mph once we get running! We also carried out another foreign object check but it was so hot that we could only managed an hour, however we did clear the worst bit and got going a lot quicker. Just another 5 miles of stretch to go. We also watched a V2 bomber fly around a bit!! It was the team’s day off on Sunday, so I went to visit the Mojave Air and Space port where Voyager took off for the first non stop flight around the world. The airfield is used as storage for unwanted civil aircraft both airworthy and for scrap. Again it was a very hot day! We welcomed cameraman Joe from the BBC who has come over on a fact finding mission to make sure that they don't miss anything for a documentary that they are producing. Our Principle Driver Charles Burnett III also joined us. Well Joe got the full disappointment of a day with the steam car! It took Joe and Charles over two hours to get clearance through the security check point. When we eventually got to the base camp it was clear that there had been some rain overnight with damp patches clearly visible. I was worried that the track might be soggy. So we were late starting and the day was hotting up nicely! We went into our static test program, but it became too hot. We had problems with the air valves, and getting the air onto the car and then the inverter began overheating. Hopefully tomorrow we will be able to redo these tests and get back to the plan of running the car on the track mid week. That meant more fodding in the mid morning heat and an inspection of any water damage. Luckily the track is still very dry. This is partly due to a nice hot wind that has started up, so I now know what a roasted turkey feels like in a fan assisted oven! Joe joined us in our merry band! Jerry and I marked out a piece of track with a GPS ready for the first proper runs on the lakebed. We were also treated to various aircraft coming in very close to us as we are now very close to the main runway. The reason that this mail is later than usual is because I had tried to get clearance to send a picture of the refueling aircraft coming into land!, but unfortunately the clearance was not given so the picture cannot be used. The weather forecast warns of more hot weather to come in this freakish blip so we need to take extra care and precautions for both the team and the car. As a result dry ice has been ordered to help keep the car cool and enable us to test for a bit longer during the mornings. Mixed news today! The heat is relentless, everything is hot to touch and that includes race suits and team fire protection overalls, ouch! We got into our first test very early, but this was stopped after the steam blew over the Steam deflector, which had not been fastened down properly! The deflector is there to push the steam up into the air and away from scalding anyone. So we had another go but it takes nearly another hour to reset everything and the heat is increasing. 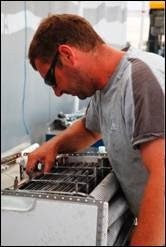 We had installed our dry ice around the inverters, however further modifications were needed to improve airflow. These took another couple of hours! 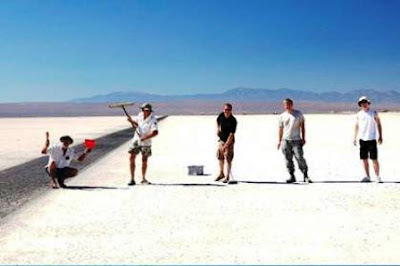 So I thought 'FOD' but we were denied access to the lake bed and our runway because of a test going on from the base! So no Fodding today! Generally the car seems to work in three's and the next test was the third of the day, but it was getting towards midday and mighty hot. So if the car worked on this occasion it would work out on the lake bed in the severe hot conditions. Success we had a very good 90 second burn and I was able to perform a throttle test. The throttle test was not a complete success and another was planned after lunch. Rob performed his usual magic and we set up again, but it was now too hot. This time the rigs let us down, fuel in the pumps was vapourising! We were pushing our luck with the temperatures and will have to work earlier on the attempt days. Tomorrow is another throttle test!! My family has often told me that I am accident prone and clumsy. Well today I cannot be blamed for all the breakages! The count so far today is two boilers and one broom. The boilers were in the car during our static test before breakfast to establish the throttle position. This time we hoped that the wheels would at least move, and move they did for a whole two revolutions whilst I applied the throttle. The test was declared a success but we needed one more test to open the throttle fully. Whilst we were having breakfast the puddle of water under the car had widened and it was suspected that a boiler had blown. On closer inspection two had given up. We will probably lose all of tomorrow but at least it will save time in the long run. So Fodding again! Hopefully Friday and Saturday will see the car on the lakebed prior to high speed runs next week! This morning was positively cold on the lake bed, a chilly breeze, ideal fodding weather! I organised or rather press ganged a merry team of Fodders. We managed a whole 4/10ths of a mile before breakfast a new record. We were treated to some great air displays from our American hosts. We were Fodding at the start of the main runway where it crosses our track and got to see take offs and landings at close hand. We came in for a late breakfast and went straight back out again and achieved another 3/10ths! The midday temperature has dropped by a whooping 8-9 degrees F today was only 107 F almost woolly jumper weather! The mechanical team worked late in to the night to get the car ready for static tests first thing tomorrow morning. It was a tremendous effort, well done! We hope that the tests tomorrow will be successful and we can move onto the lakebed on Saturday for track and car evaluations. We were up nice and early, the alarm was set for 4.00am and we were all on the base by 5.00am. 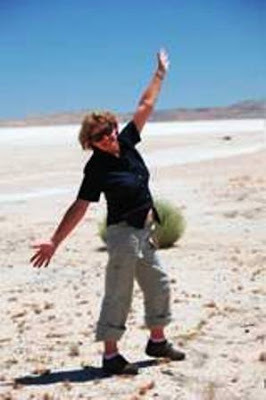 All the equipment and the car were made ready for the short journey from our base to the lakebed and our runway. We had made out a distance similar to Thorney Island where we ran in April to get some comparison data. We had a start team and a turnaround team to do two runs. The second run would be a coast down to find the rolling resistance of the track and I would get the car up to about 100mph. The sunrise was spectacular and the teams set up their stations. The Edwards AFB fire crews came out and we went through an 'unconscious' extraction from the car, which I always look forward to...NOT! We continued fodding (clearing the track of foreign object debris) and have now completed 2 1/2 miles. So it was another day of record breakers luck! However, it was still a good day for practicing getting everything out onto the lakebed. We also had a lot of time with Charles getting him familiar with the car and start up procedures. Monday is another day; the team will be fitting new gas pumps. The time keepers have also been penciled from Wednesday through to Tuesday. So we need a bit of good luck now! Today (Monday) we had some excellent news, we took delivery of an FOD BOSS! (foreign object debris remover) This is a replacement for us manual operators. It’s a mechanical device that is pull behind a truck and scoops up all the FOD, its positively brilliant and is certainly faster than us! We can scrape a 30ft wide track in about 6 passes at 15mph. We now only have 2 more strips to do and will then walk it as a final check. Unfortunately one of our team members Rob was taken ill and is currently in hospital awaiting tests, get better soon Rob, we need you back for our breakfasts! The new gas pumps have now been fitted to the car and a successful static test was completed late today. So it’s back on the lakebed tomorrow early to repeat our Saturday schedule of tests but now with more track available we might get a decent head of steam up and see what we get! The Edmonton INDY is in the middle of a three-year contract to bring the race to Edmonton. It would be a shame to see this Canadian venue go by the way of, say, Vancouver. Edmonton has been one of the better temporary courses ever set up and is similar to the type of race that another defunct venue had in Cleveland Burke Lakefront airport. 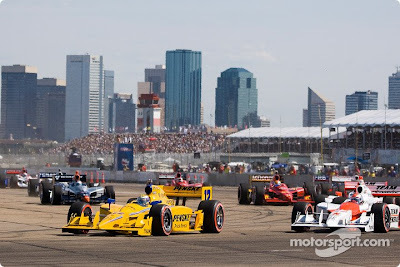 Edmonton INDY is the 11th race of the IndyCar Series 2009 season and it has been another tough year for the fortunes of the Transition Players with only one consistent highlight ... flashes of brilliance from Will Power, Justin Wilson, Graham Rahal, and Paul Tracy but little in the way of consistency. Order given to have drivers to the cars! IndyCarNationDrivers introductions have begun at Edmonton City Centre Airport. Second of four Snowbirds flybys will be 15 minutes. 15:44:58 GMT-0600 Lap 0: All cars are away from the grid for the pack laps. Green flag 2nd time by. 15:48:55 GMT-0600 Lap 0: Mario Moraes has some damage after going off course. IndyCarPRLap 1: #5 Moraes is off course in Turn 5 with damage to the car. #24 Conway off course in Turn 14. 15:53:36 GMT-0600 Lap 5: The lead has dropped to around one second. VisionRacing10 laps in + Will Power is leader. Red car. Red car. Red car. (Normally) Red Car. But OH CANADA!! PT is P6 + looking to get in the mix! 16:00:00 GMT-0600 Lap 11: Will Power has a comfortable lead, but isn't pulling away. 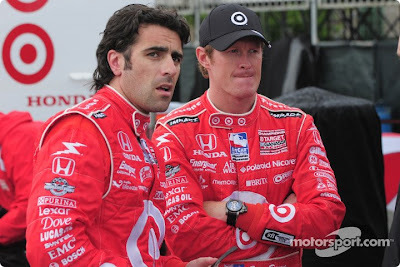 Top five Will Power , Ryan Briscoe, Helio Castroneves, Scott Dixon, and Dario Franchitti - go figure. The good news is that Paul Tracy is on Dario's rear wing in sixth. 16:01:22 GMT-0600 Lap 12: Will Power just had his fastest lap of the race. IndyCarPRLap 12: #12 Power leads #6 Briscoe by 1.5258 seconds. Matos got his car fixed and is heading out on the track 14 laps down! 16:07:15 GMT-0600 Lap 18: Tomas Scheckter is back out after a pit stop. He appeared to have no damage. VisionRacingI gotta say, the Luczo Dragon crew helmets and mirrored googles are awesome looking. Very Star Wars looking. DRRIndyCarTomas reports rear suspension damage. Car looks ok.
VisionRacingEngineer Jeff Britton on radio: " Keep after it. You're catching him!" Refering to Ed hunting down Antinucci. Ed reporting understeer in 9.
pressdogdoes power pull over at the end to "accidentally" let Briscoe by since he's in the championship hunt? 16:10:44 GMT-0600 Lap 21: A battle for P10 is developing between Justin Wilson and EJ Viso. 16:11:49 GMT-0600 Lap 22: Richard Antinucci is in the pits for an extended stop. VisionRacing8 laps to pitstop. Vision crew will try to get Ed a spot in the pits. PlanetIrldotcom@pressdog Lockstep would be a compliment. That means they're close! 16:13:40 GMT-0600 Lap 24: The lead of Will Power is increasing with each lap. 16:16:46 GMT-0600 Lap 27: The lead of Will Power has stabilized around four seconds. VisionRacingEd coming in this lap. Turn and a half front wingm taking reds off and putting black firestones on. And fuel of course. 16:20:27 GMT-0600 Lap 30: The lead cars are working their way through lapped traffic. FuriousWedgedid Dixon just go over a speed bump coming out of the pits, he got some serious air! Marco26WebDan's in - so Marco has a chance to make up some time on the track before his own stop. Rahal and Doornbos pit - Tony Kanaan's car is on FIRE! 16:27:12 GMT-0600 Lap 36: The fire was in the cockpit of Kanaan's car, but it appears he is uninjured. 16:28:19 GMT-0600 Lap 37: Ryan Briscoe is working on the lead of Will Power as it continues to come down. lesleyworldScary pit fire for Tony Kanaan, but great to see all of the other team's crews running out immediately to help. VisionRacing@tonyKanaan waving to fans on his way to medical. He's okay. VERY wet. But okay. IndyCarPRLap 34: Leader #3 Castroneves on pit lane for four black tires and fuel. #11 Kanaan exits pits with a fire on-board. 16:31:35 GMT-0600 Lap 40: Dan Wheldon off course and continue in Turn 3. 16:33:42 GMT-0600 Lap 42: Will Power is looking strong as his lead stays around 2.5 seconds. DRRIndyCarBoth our cars seem to be back running smoothly. VisionRacingEd is P17 w/ Mutoh + Wheldon ahead. @ryanracing is P11. Elsewhere... Power leads (understatement!) Followed by parade of red cars + PT. 16:35:42 GMT-0600 Lap 44: Helio Castroneves is running laps quicker than Will Power as the gap continues to go down. We are nearly half of the way through, we've had off track excursions, bumping, scrapes, and fires but NO YELLOW FLAGS! IndyCarNationLap 45: #12 Power leads #3 Castroneves by .6861 of a second. IndyCarNationLap 50: Working heavy traffic, #12 Power leads #3 Castroneves by .6265 of a second. VisionRacingNext stop Vision crew will go to red Firestone tires. (Yes 4 tires. This is not NASCAR) Full tank of Ethanol. No wing adjustments. 16:44:32 GMT-0600 Lap 52: Will Power has had the strongest car all day. pressdogProbably won't be any real racing here until after last pit stops. Wake me up when that starts. 16:51:37 GMT-0600 Lap 59: Will Power has every lap that he has been on the track and not in the pits. kvracingPT pitting again for red tires and fuel. Lap 61 or 95. Hitting a little bit of traffic but everything is good. 16:55:43 GMT-0600 Lap 63: Will Power gives up the race lead for what should be his last pit stop. IndyCarPRLap 61: #10 Franchitti to pit lane for four black tires and fuel. #15 Tracy pits for four red tires and fuel. DRRIndyCarGetting ready for a routine stop with Mike. 16:57:06 GMT-0600 Lap 64: Ryan Briscoe takes a pair of scuffed red tires. lesleyworldAh, that's good, the cameraman couldn't figure out which one was Paul Tracy. And now Jon can't figure out where the cars are on the track. 16:59:13 GMT-0600 Lap 66: Ryan Briscoe gets around Dixon for P2. 17:00:10 GMT-0600 Lap 66: Helio Castroneves is the next driver to look at getting around Scott Dixon. VisionRacingPower in lead. P2 Dixon locked up his front brakes. Briscoe gets past Dixon. Mixes up order... Red car. red car. red car. Oh wait nevermind. pressdogthat was it, kids. the excitement for the day, baring air strike. thanks for watchin. mariomoraesindyHave a team mate like this for what ? 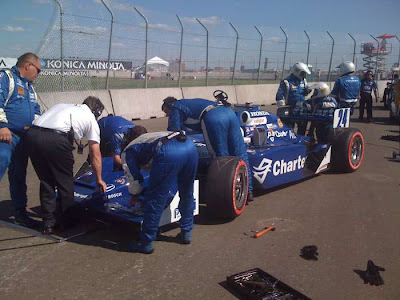 better dont have any one ..
IndyCarPRLap 62: #12 Power and #3 Castroneves on pit lane for four black tires and fuel. New leader is #6 Briscoe. IndyCarPRLap 63: #6 Briscoe on pit lane for four red tires and fuel. New leader is #9 Dixon. 17:07:10 GMT-0600 Lap 73: Scott Dixon uses lapped traffic to get by Helio Castroneves for P2. Marco26WebL73: Lead cars make a strong move on Marco and he takes a trip across grass to avoid trouble. Lapped up to fourth, but holding P10. IndyCarPRLap 73: #12 Power leads #9 Dixon 8.8424 seconds. I missed where Dixon passed Helio. Briscoe has dropped positions from 2nd to 4th - Scuff Reds are not working out for him. 17:11:02 GMT-0600 Lap 77: Ryan Hunter-Reay has some rear wing damage and is trying to make it to the pits. VisionRacing20 laps to go in Edmonton. Power leads, Reds follow, PT chases. Nearly everyone else is at least a lap down. toomuchracingI don't like this idea of having back-to-back-to-back race weekends in IndyCar. How's a guy supposed to catch up?! 17:14:16 GMT-0600 Lap 80: The gaps between the top five are opening up. 17:15:49 GMT-0600 Lap 81: Dixon is getting slowed down by Ed Carpenter and Helio looks to try and pounce. IndyCarPRMedical update from Dr. Michael Olinger: Tony Kanaan has been checked and released from the infield care center. VisionRacingRHR @ryanracing is back on track with new rear wing. 17:17:42 GMT-0600 Lap 83: Helio is within a couple car lengths of Dixon. 17:19:28 GMT-0600 Lap 84: Helio uses a nice split move on Carpenter to take P2 from Dixon. luczodragonDespite the early set back Rafa has kept racing. pressdogum. ok, why didn't Ed just go about 10 feet wide in that huge area and let the two contenders go? 17:21:09 GMT-0600 Lap 86: Helio Castroneves used the lapped traffic to open the gap up to nearly one second. Marco26WebMarco flying again - just a few hundredths off his fastest lap of the day. DP matches it though. 17:23:13 GMT-0600 Lap 88: Most of the drivers are really spread out around the course. 17:25:10 GMT-0600 Lap 90: With five laps remaining, it is Will Power's race to lose. pressdogthis plays right into my idea to have the Lights cars on the track at the same time to provide some picks for when we are all are sleepy. 17:27:06 GMT-0600 Lap 92: Raphael Matos goes off course and continues in Turn 3. Full Course YELLOW with the WHITE Flag displayed at the same time. 17:30:39 GMT-0600 Lap 94: Will Power wins the Rexall Edmonton Indy! IndyCarPRLap 95: CHECKERED: Will Power wins the Rexall Edmonton Indy. pressdogbeen fun, kids. ups to @kevinlee23 today. awesome job. Anyone miss Arute? Didn't think so. PlanetIrldotcom@pressdog I missed his orange nuclear tan. Kevin shoudl have tried it. PippaMannCongratulations to Will Power and his guys! Great job! DRRIndyCarWe finished both cars. Days like today, that's all you can hope for! Congrats to our good friend Will Power on a much-deserved win! So, five of the top ten positions in Edmonton were occupied by Transition Players, those drivers that have been merged into the IRL from the ChampCar World Series allowing only one Andretti Green Racing driver (Michael's son, Marco) to crack the top ten on a temporary race circuit. Will Power as Transition Player, notches his first win for the Team Penske organization ... they should give him MORE races to ride in. Paul Tracy was the first driver not in a car fielded by Team Penske or Target Chip Ganassi, driving for KV Racing Technology ... another Transition Player without a ride for the near future - what in the heck is going on inside the thinking of the management of the IRL? This set up excerpted and edited from Autosport.com -A double pole winner at Toronto in his Champ Car days, Dario Franchitti posted a best time of 1m01.0249s to emerge comfortably fastest in the Fast Six session, beating Will Power in the third Penske Dallara-Honda by more than two tenths of a second. 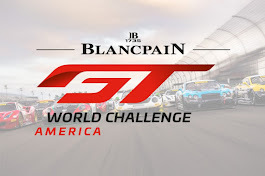 With Graham Rahal, Alex Tagliani and Mike Conway rounding out the top six, names like Helio Castroneves, Ryan Briscoe and Scott Dixon were conspicuously absent from the sharp end of the grid. 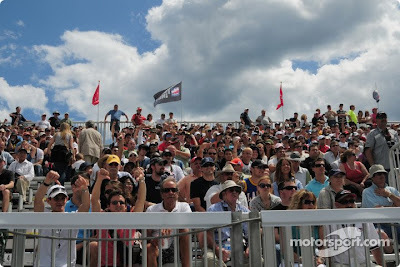 This set up excerpted and edited from Fresno Beehive - IndyCar makes its first foray into Toronto this week for the inaugural Honda Indy Toronto, the 10th event on the 2009 IndyCar Series championship schedule. 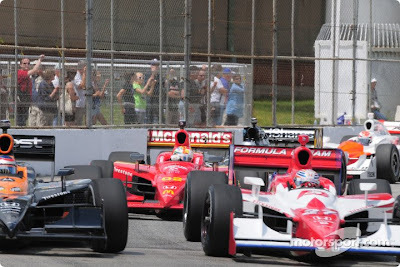 The last time racing took place in Toronto was for the Champ Car Series back in 2007, as Will Power finished ahead of Neel Jani to capture the checkered flag. Power finished seventh in his other Toronto start. The Champ Car Series had raced in Toronto since 1986, when Bobby Rahal captured the first of 22 events. 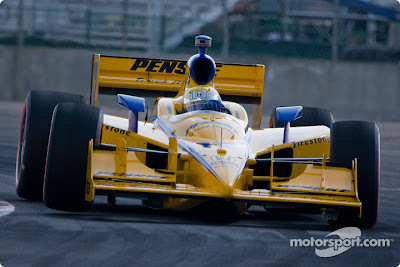 Michael Andretti owned the streets of Toronto, winning the race seven times. Paul Tracy and Al Unser Jr were two-time champions. Tracy had 11 top-10 finishes in his 16 races in Toronto. Several current drivers have had modest success in Toronto. Dario Franchitti competed in six CART races, winning two poles and capturing the race in 1999. Alex Tagliani raced eight times in Toronto and posted seven top-10 finishes. VisionRacingCars are on track and lining up for start. Green flag coming up. MyNameIsIRLCanadian Air Force just buzzed Jack Arute's tower. 13:17:44 GMT-0400 Lap 0: Will Power is off the course in Turn 1. 13:18:07 GMT-0400 Lap 0: Graham Rahal has some front wing damage. VisionRacingDamage to rahal's car. Came into pits and out again. Ed is p19. 13:20:25 GMT-0400 Lap 2: Will Power and Ryan Briscoe had flat tires. 13:22:29 GMT-0400 Lap 4: Dario Franchitti is looking strong as the lead goes over 2.5 seconds. RaceDriveHow could they throw the Green Flag for the Start for Toronto IndyCar race - That ? was lined up ? 13:26:01 GMT-0400 Lap 8: Full course yellow for contact in Turn 3 between Dan Wheldon and Richard Antinucci. VisionRacingI got distracted for a second and all of a sudden there are two Penskes behind Ed. I'm not in Kansas anymore am I? Oh Canada right. 13:29:50 GMT-0400 Lap 10: Some drivers mid-pack come into the pits to play strategy. 13:31:15 GMT-0400 Lap 10: Back to green flag racing! 13:32:32 GMT-0400 Lap 12: Full course yellow for Ed Carpenter stalled against the wall in Turn 6. He made light contact. VisionRacingEd stuck between 6+7. Never got to go green. Had crap on his tires. No damage to car. Just a flat spot on tires. 13:34:04 GMT-0400 Lap 12: Pits are open. TheEDJEI guess this puts Ed behind ALL of the Penske Team - Dang! 13:35:26 GMT-0400 Lap 13: Green flag this time by. 13:37:13 GMT-0400 Lap 14: Robert Doornbos loses two places. 13:39:19 GMT-0400 Lap 16: Dario Franchitti is extending his lead. 13:40:01 GMT-0400 Lap 17: Will Power makes his way around Hideki Mutoh for P19. PlanetIrldotcom@FuriousWedge Well they are professionals. They need to be ready for it. MyNameIsIRLI bet Will Power is having some great battling for position right now while we watch the leaders go round and round. Guess I'll never know. 13:42:49 GMT-0400 Lap 20: Dario Franchitti is gaining around .2 seconds a lap on the field. 13:43:48 GMT-0400 Lap 21: Dario Franchitti has pushed his lead to over three seconds and continues to pull away. VisionRacingOk. Top 5 is Dario Tag Dixon Conway Tracy. 2 Canucks, 1 Scot, 1 Kiwi and 1 Brit. It's the racing version of the Commonwealth games! 13:47:25 GMT-0400 Lap 24: Robert Doornbos has switched to the primary tire. 13:47:58 GMT-0400 Lap 25: Local yellow in Turn 8 for Ed Carpenter off course. VisionRacingLap 25 of 85. Dario still leads. Leaders will start to pit. Ed is a lap down but can make it up here. He radioed in that he is losing grip. FuriousWedgeHoly $&*@ Marty Reid Paul Tracy does not look at all like any other car in the field, he was 3 spots ahead of Doornbos, how do to F that up? 13:49:21 GMT-0400 Lap 26: Dario Franchitti and Marco Andretti nearly touched out of the pits. VisionRacingEd feeling a bit sheepish. Well at least we're getting a bit of TV time right. Engineer Jeff Britton tells Ed to settle down. 13:50:23 GMT-0400 Lap 27: Paul Tracy is putting pressure on Mike Conway for P3. 13:50:41 GMT-0400 Lap 27: Paul Tracy gets by Mike Conway to take P3 going into Turn 3. 13:53:22 GMT-0400 Lap 30: Paul Tracy is putting the pressure on Tagliani for P1. 13:54:46 GMT-0400 Lap 31: Scott Dixon is working Graham Rahal hard for P13. VisionRacingCanadians are 1-2 when was the last time that happened? 2003? Never mind. .
Tagliani and Tracy in the pits together! 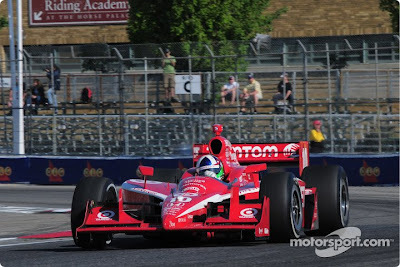 13:55:35 GMT-0400 Lap 32: Paul Tracy switches to red tires. 13:56:57 GMT-0400 Lap 33: Mike Conway make contact with the wall to blow his tire. 13:57:44 GMT-0400 Lap 34: Alex Tagliani gives up the lead to take his first pit stop. VisionRacingPT is on friggin' fire. He's putting on a drifting show on out there on the streets of Toronto. He IS the show right now. 13:58:51 GMT-0400 Lap 35: Mario Moraes gives up the lead to pit. tracksideonlineTracy is making a statement. It's called "I should be in a full-time ride." 14:02:03 GMT-0400 Lap 38: Helio Castroneves is closing in on Tomas Scheckter for the lead. MyNameIsIRLTomas Scheckter leads on a street course?? Maybe there's something to that MonaVie stuff after all. 14:04:30 GMT-0400 Lap 40: Helio Castroneves has cut the lead to under .5 seconds. 14:05:15 GMT-0400 Lap 41: Tomas Scheckter comes into the pits, giving Helio Castroneves the lead. RacingNationBTW, the Will Power car is based on Al Unser's cars circa 1983-1987, he usually had the blue trim, Mears had yellow with red trim. 14:06:27 GMT-0400 Lap 42: Will Power slid through his marks in the pits. FuriousWedge"I get my red and wiht mixed up" umm Reid, just get up and walk out of the booth now, let Welch fill in, he knows his stuff; "
TheEDJEMarty Reid is a baffooooooone! tracksideonlineThere's a great battle between Kanaan, Power, and Viso while ABC watches the leaders trundle around. 14:09:14 GMT-0400 Lap 44: Due to various pit strategies, Helio Castroneves has a five second lead. MyNameIsIRL"We've learned that Richard Antinucci's car has been taken behind the wall". Sounds like they're going to put it down. About time. 14:13:07 GMT-0400 Lap 48: Helio Castroneves gives up the lead for what could be his last stop of the race. He takes a set of red tires. VisionRacingGet your popcorn ready. Tag + Tracy battle up front coming up... Ed coming in to pit next lap. tracksideonlineWilson pits. They must think they can make it 35 laps on a tank of fuel. Castroneves is trying the same thing from one lap further. 14:15:41 GMT-0400 Lap 50: Tony Kanaan is in the pits to get some sticker red tires. kvracingPT is now P2 and MM is P4 now that everyone has pitted. Lap 51 of 85. TheEDJEGotta' love the CCWS "Transition Player" influence in this race! MyNameIsIRLDario is all up on Moraes and...they cut away. Is there a rule that we're not allowed to see any actual passing? 14:21:33 GMT-0400 Lap 56: Paul Tracy switches from black tires to sticker reds. 14:23:50 GMT-0400 Lap 58: Full course yellow for contact between Graham Rahal and Ed Carpenter. VisionRacingYeah that was our car...airborne. And Rahal in the wall. Ed says car feels okay. He's staying out. 14:26:34 GMT-0400 Lap 59: Pits are open. PlanetIrldotcom@VisionRacing How? He was in the air! As in not on the earth! FuriousWedgeWhy does it seem like ABC is still not paying attention to the fact that Helio is in a prime position for this race!? 14:30:42 GMT-0400 Lap 61: Back to green flag racing! tracksideonlineMutoh getting inhaled on the restart. 14:32:27 GMT-0400 Lap 63: Paul Tracy got a little loose going into the turn. 14:33:14 GMT-0400 Lap 64: Dario Franchitti takes the lead out of Turn 1. 14:34:12 GMT-0400 Lap 65: Paul Tracy is looking to move into P2 and is all over Helio Castroneves. 14:34:58 GMT-0400 Lap 65: Full course yellow for contact in Turn 4 between Paul Tracy and Helio Castroneves. MyNameIsIRLOMG! 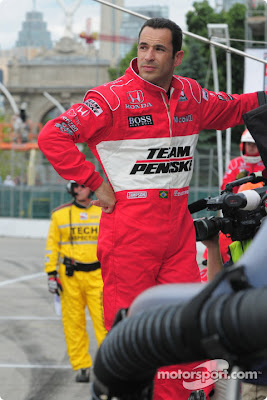 Of all the guys to take out PT it had to be Helio! chunter16Vintage Paul Tracy. They both deserve the damage though. 14:38:28 GMT-0400 Lap 67: Pits are open. VisionRacingIf we have to replace a tow link, they'll have to shut the motor off. Coming in. 14:44:39 GMT-0400 Lap 71: Will Power moves into P3 after making a great move on Justin Wilson. 14:45:50 GMT-0400 Lap 72: Local yellow in Turn 3 as EJ Viso and Mario Moraes lock up the brakes going into the turn. PlanetIrldotcomGet off the track and let the real drivers fight it out. Do not charge into a corner that late. You got what you deserved. Now, where was I? 14:46:43 GMT-0400 Lap 73: EJ Viso is restarted and returns to the race. MyNameIsIRLThey need to be playing the theme from "Jaws" whenever Power is shown today. He's been devouring people all day. 14:48:39 GMT-0400 Lap 75: Mario Moraes continues on as Scheckter is in the tires and Tagliani is restarted. 14:49:23 GMT-0400 Lap 75: Pits are open. 14:50:53 GMT-0400 Lap 76: Mario Moraes gets a new front wing and returns to the race. 14:53:51 GMT-0400 Lap 77: Back to green flag racing! 14:54:20 GMT-0400 Lap 78: Dario Franchitti gets a great restart and pulls away. MyNameIsIRLMarty Reid just confused Tagliani's white car with Viso's grey car. Can we get a sobriety test in the broadcast booth? tracksideonlineReally? We need to play ask the analyst with six laps to go? Try again, ABC. 14:56:10 GMT-0400 Lap 80: Scott Dixon is looking strong as he is all over Will Power. 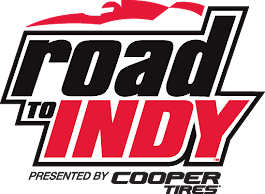 So it is Briscoe, being led by Franchitti and being followed by teammate Will Power then followed by Scott Dixon. More Ganassi, Penske, Penske, Ganassi racing. At least this wasn't an oval. 14:59:09 GMT-0400 Lap 82: Will Power and the train behind him have caught up to Ryan Briscoe. PlanetIrldotcom@openpaddock You don't come from that far back and stick your nose in. But it is PT so sticking his nose where it doesn't belong is normal. 15:00:21 GMT-0400 Lap 84: White flag. 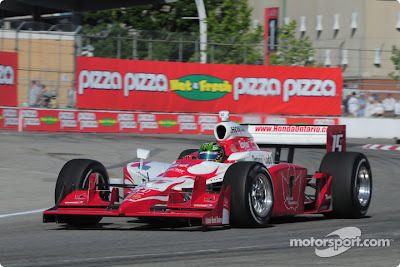 Dario Franchitti leads Ryan Briscoe by 1.6048 seconds. indy44I still don't like the call by officials to let Dario pit,BS!!!! PlanetIrldotcomEveryone get your mute buttons ready. ASLEY JUDD ALERT!!!! 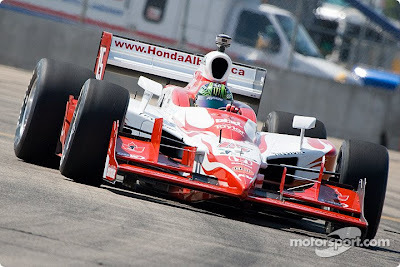 15:01:16 GMT-0400 Lap 85: Dario Franchitti wins the Honda Indy Toronto! MyNameIsIRLGanassi, Penske, Pesnke, Ganassi. Then universal underdog Justin Wilson. RacingNationDario Wins! Dario dominates today. Cue Ashley. indy44Will Power best of the rest,good job! 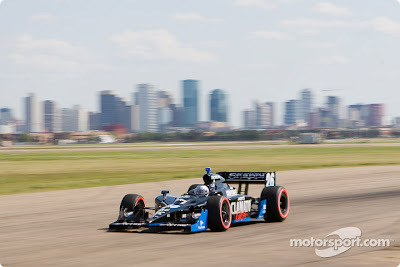 The next race on the IndyCar Series schedule is the Rexall Edmonton Indy, July 26th at Edmonton City Centre Airport. 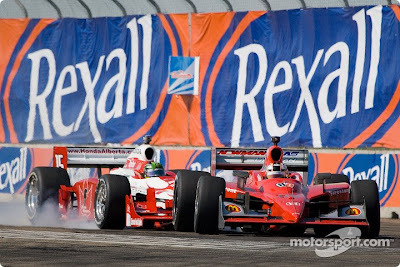 Scott Dixon is the defending champion of the 2008 Rexall Edmonton Indy.